The Oh Really » Don’t Mess with the Crap You Find at the Texas State Fair. A Solicitation. | Home | Double Dose of Gross. Don’t Mess with the Crap You Find at the Texas State Fair. You will be happy to know that my brother, aficianado of all things fried and/or horrible, recently tried fried Coke at the Texas State Fair. Yes, that’s right: globs of fried Coke-flavored dough covered in syrup and whipped cream. If you fry it, they will come. This entry was posted on Monday, October 23rd, 2006 at 12:02 pm and is filed under Uncategorized. You can follow any responses to this entry through the RSS 2.0 feed. Both comments and pings are currently closed. I’m sure it’s just the hormones talking, but that actually sounds pretty good. 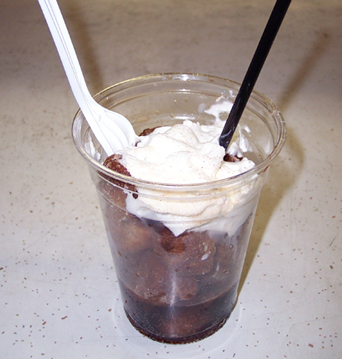 When I first saw this, my brain was abviously trying to make sense of it all, b/c I read that it was frozen coke. Which wouldn’t be weird at all. So I was wondering what you were yammering on about. But then I saw… FRIED… which.. well. Is Coke more popular in the South than Pepsi? Coke is king in the South. I have been told that Pepsi outsells Coke in most other parts of the country. But in the South they have to give Pepsi away to get people to drink it. Coke is a big Atlanta based company. In sime fringes of the South it used to be RC with a moon Pie but we’re talking 40+ years ago. It’s also a generatioonal thing., More young people drink Pepsi; its formula is sweeter. When I was growing up in Raleigh Mississippi there was this one kid who would stand outside the general store and dance like Elvis and sing Blue Suede Shoes for R.C. colas and moon pies. I wonder if he is now a 40 year old still doing this and if it is still hilarious or just really sad or maybe both.